Summary: From Jane Green, the New York Times bestselling author of such beloved novels as Jemima J, The Beach House, Another Piece of My Heart, comes an enthralling and emotional story about how much we really understand the temptations that can threaten even the most idyllic of relationships…. 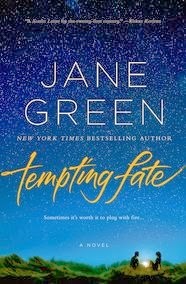 Just late week, I reviewed Jane Green's latest novel TEMPTING FATE. I enjoyed the book despite having some pretty major issues with the main character, and I certainly think the book will generate a lot of intense feelings from its readers. As a result, it truly is an ideal book club selection! To celebrate the official release of TEMPTING FATE, I have a copy of the novel to share with one lucky reader. To enter, just fill out the form below before Monday, April 7th at 11:59 p.m. EST. I will randomly select and notify the winner the following day. This contest is open to those of you with U.S. addresses only. Good luck! I'd love to win this since I'll see the author next month. Thanks for the giveaway! I'm curious whether I'll like this one, so thanks for the giveaway.